Len Evans was bitten early and that was it. He remained an enthusiastically successful promoter of the ‘good, familiar creature’ until his untimely death in August, 2006. But after almost half a century of a life in wine he wasn’t keen on getting into the autobiography business. ‘I was asked to write my memoirs, but I didn’t like the idea – for one reason I’m still living them, and for another, my many conceits do not include a belief that my life has been particularly fascinating,’ he said in 1985. 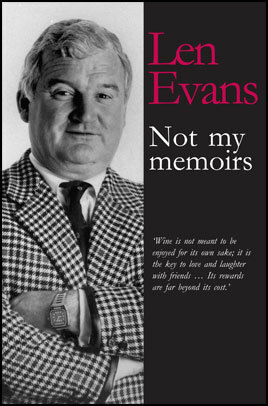 Well he didn’t write his memoirs but he left us something else that is uniquely Evans – an anecdotal ramble through a life devoted to the production, promotion – and drinking! – of wine. There are occasional detours to paint a picture of an old mate, tell a wise or hilarious wine tale or just spin a good yarn. In 1979, Len wrote of a friend’s book: ‘It’s a funny book, it’s a serious book. It contains something for every wine lover.’ Few words could better describe what he has left us here. 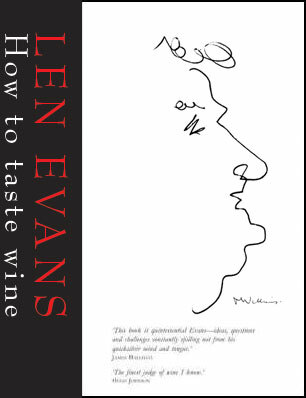 Len Evans died, aged 75, on the seventeenth of August, 2006 after a life – to quote the Sydney Morning Herald obituary – as ‘a promoter, taster, judge, consumer, teacher, maker and drinker of wine’. The sum of all these talents, skills and vocations made him, as the obituary heading said, ‘an influence worth bottling’. Landing in Australia in 1955, he had a remarkable variety of occupational diversions before fate placed him on the path he was to follow for the rest of his life. As beverage manager of the Chevron Hilton Hotel in Sydney he found a firm focus for his interest in wine, establishing the largest retail cellar in the country. By the time Len entered the wine industry proper and joined the Australian Wine Board in 1965, he had marshalled his not inconsiderable writing skills to promote the wines of his adopted country. His influential ‘Cellarmaster’ column in The Bulletin was the first regular wine column in Australia. In the 1970s, Len led a wildly successful venture as proprietor of the legendary Beef and Tasting rooms at Bulletin Place. For 11 years he edited the monthly The Wine Buyer and while energetically establishing himself as a wine consultant, vigneron, judge and lecturer he found time to write the encyclopaedic Australian and New Zealand Complete Book of Wine and the Complete Book of Australian Wine. Although he modestly evaded the siren call of publishers for a full-blown autobiography he did resharpen his pen before he left us to provide a refreshingly informal window onto his life. To purchase a copy now, go to our purchase page. Read Huon Hooke's review (Sydney Morning Herald, Good Food Section, Tuesday 16 October 2012) for Not My Memoirs. Len Evans had a lot of wise things to say about wine...sadly, he has gone, but luckily for us before he went he not only spoke, but he wrote. The man described by the Oxford Companion to Wine as having ‘done more to advance the cause of wine in Australia than any other individual’ has left a precious legacy. After a lifetime of experience, here are the essentials of wine tasting, the fundamentals of evaluating the nuances of wine. In his inimitable style, occasionally debunking conventional wisdom and pricking pompous balloons, he explains the ins and outs of wine tasting accompanied by a rare exploration of the world of wine judging. Len explains how, after considering colour, he judged wine in five ‘compartments’ – nose, entry, middle palate, after palate and finish. His unique graphs delineate the structure of wine and show on the page how your palate reacts to different wines. Judging colour is illustrated with informative photographs of old reds, new reds and varietals. Beyond wine, friends recall Len’s joie de vivre, the boundless energy and enthusiasm that marked all his passions: for architecture (he was a gifted amateur), for sculpture (less gifted), and for playing brass musical instruments (no apparent gift whatsoever). But above all, they remember a man generous with his time, his wine and the lightly-worn wisdom that spills from these pages. Len Evans has gone, but luckily for us, before he went he not only spoke, but he wrote. The man described by the Oxford Companion to Wine as having ‘done more to advance the cause of wine in Australia than any other individual’ has left a precious legacy. After a lifetime of experience, here are the essentials of wine tasting, the fundamentals of evaluating the nuances of wine. Evans on wine: "Wine is not meant to be enjoyed for its own sake; it is the key to love and laughter with friends...its rewards are far beyond its cost."